Alpaca Jump is a foolish, glitchy and unusual jumping game, featuring a silly blue Alpaca! Jump, bounce and fart around! 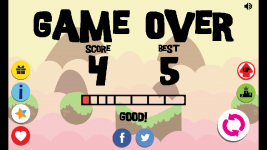 Control a funny and unpredictable Alpaca ragdoll, and show some stupid, awesome moves! Change your appearance, becoming more and more fabulous, and challenge your friends online! Shine as an Alpaca never did before! Post news Report RSS	Get Alpaca Jump without ads for FREE - only for today! Today, Alpaca Jump is going to be featured as "free app of the day" within AppGratis! For the next 24 hours, new Alpaca Jump users will be able to unlock the full version of the game, without annoying ads, forever, for free. 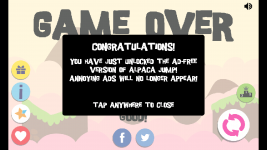 Get the free, no-ads version of Alpaca Jump, right now, thanks to AppGratis! I'm happy to announce that, for today, Alpaca Jump is going to be featured as "free app of the day" within AppGratis! For the next 24 hours, new Alpaca Jump users will be able to unlock the full version of the game, without annoying ads, forever, for free. 3. 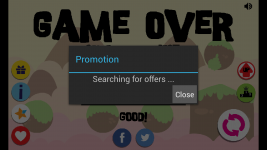 When the offer is found, the popup will be closed and you'll have your free full version of Alpaca Jump, forever without any annoying ad! Note that this will only work for new users, installing Alpaca Jump during the period between 2014/11/23 12:00 and 2014/11/25 12:00. Many thanks to the AppGratis team for having chosen Alpaca Jump as "free app of the day"!What are you waiting for?Get Alpaca Jump now from Google Play!